At £10 a pack I will admit that they are a little on the pricey side, the good news is that a pack contains three sheets of nail stickers - each of which features more than 50 stickers per sheet. If you have friends or family members who also enjoy nail art you could maybe chip in and split a set to save a little money? The ASOS, Lottie London and Walls Twister Nail Stickers come in various sizes from fairly large (great for thumbs and big toes), all the way down to dinky pinky read sizes (great for kids nails too). Unlike typical nail decals these do not require water, simply peel off, stick down and seal with a quick layer of top coat. The whole process could not be easier if it tried - the most trying step is waiting on your chosen top coat to dry. If like myself you struggle with water transfers these are quite the revelation, not to mention they look great over just about any nail polish. Simple, fun and quirky - what is not to like? ASOS, Lottie London and Walls Twister Nail Polish and Stencil Set £15 - link. 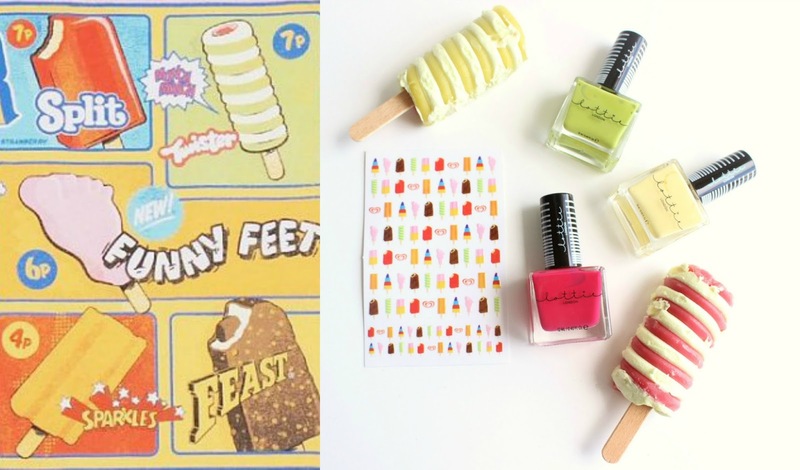 Three bright and obviously Walls Twister inspired nail polishes, that come complete with peel off nail stencils to mimic the whirls of the iconic Summer treat that is a Twister ice lolly. As I have gel nails at the moment, I have not personally tested the above shades but I am familiar with the Lottie London formula and can vouch it is great. The polishes tend to be quick and easy to apply, dry quickly and on average require two thin coats to achieve full coverage. 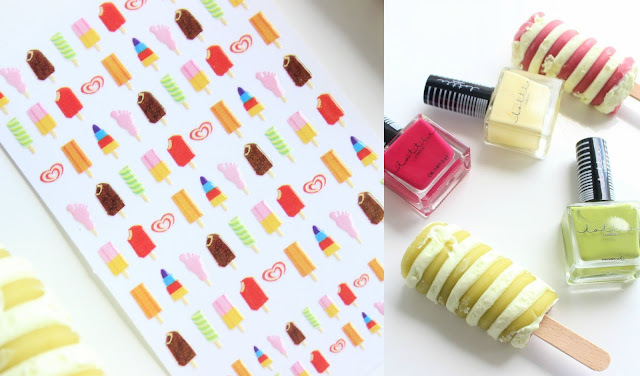 You can of course apply the polishes as stand alone colours, merge with the peel off stencils to create an ice lolly inspired design and/or team up with the ASOS, Lottie London and Walls Twister Nail Stickers - the choice is yours. The three shades within the ASOS, Lottie London and Walls Twister Nail Polish and Stencil Set are: Day Dreamer - soft lemon creme, Selfie - bright, glossy cerise and lastly Twister and Shout (kit exclusive created just for ASOS and Walls) - bright, lime green crème. I know that may seem a little clichéd but all three shades are perfect for Summer be it on tanned, deep or pale skin - how many polishes can you say that about? You can find the entire ASOS and Walls collaboration here, which included clothing, shoes and nail products here - link. Those stickers are the cutest thing I have ever seen! I don't usually go for green polishes but this one looks lovely. I need them all. The Twister nail stickers are so unusual and cute. 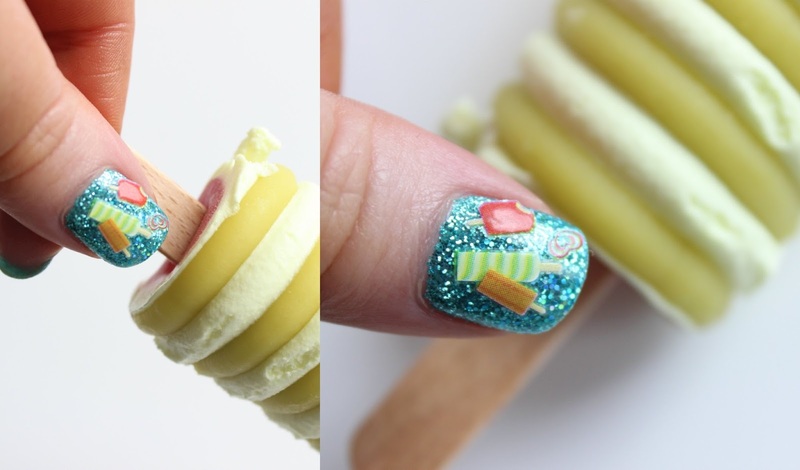 This is such a fun idea and perfect for the summer. These are such fun colours. Lovely for the summer months!